Fruitcake mines need to be a thing. I am surprised you have never had Fruitcake mines in the Zmas things. Those things would be deadly. Don't expect to find reinder dogs that explodes into confetis either. Terror-Dome ... Z-Mas ... 50% off!!! AWESOME! Thank you Con & Team. And a merry Z+X-mas for all of you. Terror-Dome ... Con, the fuel cost is still 170 on lv60 ... so not 50% off? Please advice, thank you. Ah yep! Separate database for Kong. Fixing now! Really appreciate the drop rates of items this time around. From what I can tell cold steel is a bit easier to find than parts from any previous event, the 100 free pieces was helpful too. It's a nice touch too bringing back the junk containers that can be recycled for more stuff. Anyone gotten any good crafts yet? Just curious. I just crafted the arctic auto revolver with 20% aps bonus and assault kit, I'm trying to see if someone got a 25% craft with an assault kit. Also, Con, any updates on weapon stats? People are still disappointed with the Fal, will there be any changes to the gun? It either needs a different counter, or much more range. Edited by Luisssboom, 21 December 2017 - 08:46 PM. What 100 free pieces of cold steel? I never got 100 free pieces. Drop rate doesn't seem to be very high either. Been scavenging for 2 days and I'm only up to 37 cold steel so far. 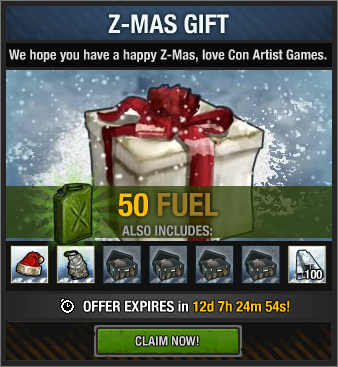 There is a free package containing 50 fuel, 100 pieces of Cold Steel, some Abandoned caches, a Santa hat and a Santa beard. You can find it between the Christmas packages (the "box" icon under the Resources indicators). Also, 37 pieces of steel in only two days seems like a pretty healthy drop rate, considering that it will last for about a month. Edited by Lana Woo, 21 December 2017 - 11:30 PM. I never got that package. I only have 6 winter packages for sale and the tactics cache package for sale. There was no free package. Is it because I'm on Kong? Hm, maybe is the same issue that the Terror Dome, then. Do you guys have the TD update now? We Need this in Kongregate!! Con must HELP us!!! That's why I tried it for the first time. Two tries with both a bronze reward and I got a lot of cold steel with now 89 of them, plus the first try refunded me 50 fuel (it costed me 60). It was worth trying in the end.